WATCHING a chemist struggling to pipette an unusually viscous oil sample into a standard autosampler vial, Jerry Finneran recognised that standard labware wasn’t making this tedious job any easier. Because of the viscosity of the sample, the oil was adhering to the neck of the vial and slowing the chemist’s work to a crawl. The two-part Vista Vial is his answer to this problem. Consisting of a glass base and a polyethylene top that snaps onto the base, the final assembly forms a standard 12x32mm autosampler vial compatible with most lab automation systems. 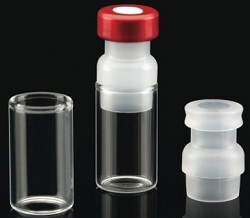 The borosilicate glass base provides a 1.0ml volume with a wide target area for pipettes, and is said to be ideal for highly viscous and foaming samples. The polyethylene top is available with a choice of threaded or snap-seal closures and septa, which can be incinerated intact without the need for closure removal if the sample demands this. There is no need for a decapper to remove the polyethylene top from the glass base, avoiding the common risks of broken glass or sharp metal which can be caused by decapping aluminium seals.